Glaucoma is a disease that damages the eye’s optic nerve. The optic nerve is connected to the retina, a layer of light-sensitive tissue lining the back of the eye, and is made up of many nerve fibers like an electric cable is made up of many wires. It is the optic nerve that sends signals from your retina to your brain, where these signals are interpreted as the images you see. In a healthy eye, a clear fluid called aqueous humor circulates inside the front portion of your eye. To maintain a constant healthy eye pressure, your eye continually produces a small amount of aqueous humor while an equal amount of this fluid flows out of your eye. If you have glaucoma, the aqueous humor does not flow out of the eye properly. Fluid pressure in the eye builds up, and, over time, the increased pressure causes damage to the optic nerve fibers. Glaucoma can cause blindness if it is left untreated. Only about half of the estimated three million Americans who have glaucoma are even aware that they have the condition. 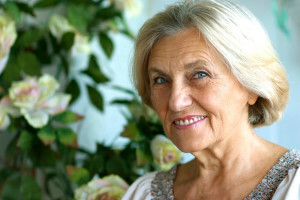 When glaucoma develops, there are usually no early symptoms and the disease progresses slowly. In this way, glaucoma can steal your sight very gradually. Fortunately, early detection and treatment with glaucoma eyedrops, glaucoma surgery or both can help preserve your vision. There are many different types of glaucoma. The most common type, Open Angle Glaucoma, occurs when the trabecular meshwork of the eye gradually becomes less efficient at draining fluid. As this happens the pressure inside the eye rises. Increased eye pressure leads to damage of the optic nerve. Damage to the optic nerve can occur at different eye pressures among different patients. Your ophthalmologist establishes a target eye pressure for you that he or she predicts will protect your optic nerve from further damage. Different patients have different target pressures. As the optic nerve becomes more damaged, blank spots begin to appear in your field of vision. You usually won’t notice these blank spots in your day-to-day activities until the optic nerve is significantly damaged and these spots become large. If all the optic nerve fibers die, blindness results. Half of patients with glaucoma do not have high eye pressure when first examined. Some individuals will only occasionally have high eye pressures on repeat testing; thus, a single eye pressure test may not be enough to indicate the presence of glaucoma. In addition to routine eye pressure testing, it is essential that the optic nerve is examined by an ophthalmologist for a proper diagnosis. Angle Closure Glaucoma is much less common than Open Angle Glaucoma. There are a subset of people with Open Angle Glaucoma who never have high eye pressure. In this case, they are said to have Normal Tension Glaucoma. 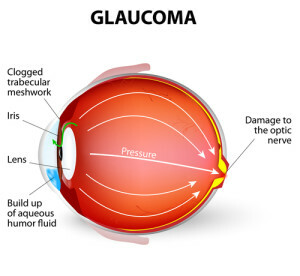 Angle Closure Glaucoma occurs when the drainage system of the eye becomes blocked. Unlike open-angle glaucoma, eye pressure usually goes up very fast. People of Asian descent and those with hyperopia (farsightedness) tend to be more at risk for developing this form of glaucoma. If the drainage angle becomes completely blocked, eye pressure rises quickly resulting in a closed-angle glaucoma attack. Certain types of drugs such as over-the-counter cold medicines and drugs for treating bladder disease can cause Angle Closure. Glaucoma can also be congenital (present at birth) or caused by trauma or other eye diseases. Non-surgical treatment for Open-Angle Glaucoma generally consists of one or more categories of eye drops that are used to lower eye pressure to a “safe” level. If pressure can’t be lowered sufficiently with medication alone, then various laser and/or surgical procedures may be indicated. Generally, Angle-Closure Glaucoma is treated either with specialized laser therapy or surgery.